This suite consists of a two/three seater bench, a pair of open armchairs and four single chairs, all of exceptional quality. Each of the pieces consists of a profusely carved and pierced back depicting an elongated, writhing dragon with scaled body with vine leaf, grape and stylised floral and foliate carved decoration. This leads down to a moulded seat of superb patina, the bench and single chairs having carved gadroon decoration to the edge, the armchairs with a carved ball design. 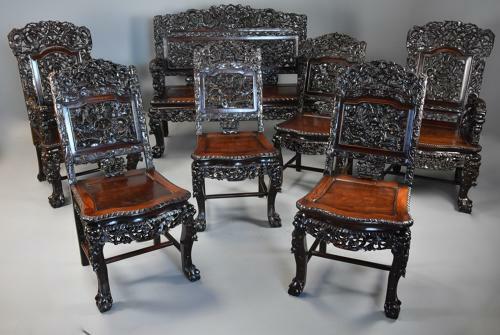 The arms on the bench and armchairs consist of carved dragons holding a pearl in their mouths, the pearl in the mouth representing treasure and prosperity, the back rail underneath the arms with carved bat design. This leads down to a heavily carved and pierced deep seat rail, the bench consisting of a central oval design of carved birds, the armchairs with carved crane and deer, the single chairs with carved and pierced vine leaf and grape design. Each piece is supported by carved cabriole legs with floral and foliate decoration terminating with a claw foot, the back legs of outswept design terminating with a claw foot, the six chairs supported by an H stretcher. The animals depicted are symbolic in China: the dragon - courage, the dragon with pearl in mouth – treasure and prosperity, the crane - longevity, the bat - good fortune, the deer - happiness and good fortune. This superb suite is in excellent condition for age, is all of stable construction and can go straight into a home.